The Bassac River (commonly referred to as Tonle Bassac) is a tributary of the mighty Mekong River and runs parallel to its bigger neighbour as it flows south from Phnom Penh and out to the Vietnamese border near Chau Doc. Its a popular entry and exit route for locals between the two countries and an area rich in many varieties of produce brought about as a result of the annual floods. My plan was to take a relaxing day trip with my moto-driver Tom and follow the Bassac along its west bank, cross the river and return to Phnom Penh along its east bank, stopping at intervals along the route. My trips aren't all about discovering ancient temples. One of the real pleasures about Cambodia is the ability to enjoy simple, unhurried trips into the countryside with no agenda other than to enjoy the scenery and to interact with the locals. After breakfast at the Dara Reang Sey, we left at 8am, out along busy Norodom Boulevard, and onto Route 2 past the garment factories until we reached Takhmau town. Once over the bridge, we turned left and followed the 'local' road as it hugged the riverbank rather than take the sealed Route 21. Bouncing along the bumpy track, under the shade of overhanging trees, this gave us a typical insight into morning life as we passed through small riverside villages where children walked to school, toddlers played in the dirt, women haggled with each other at vegetable stands and their menfolk stood around, typicially doing very little. A few hello's were heard though my krama was over my face because of the red dust kicked up by a couple of passing cars - I'm often surprised that the locals can recognise I'm a foreigner even though my face is shrouded in a krama. We stopped at a couple of pagodas though both were of the modern concrete variety and typical of the type you find dotted throughout the Cambodian countryside in recent years. At Roka Khpos we left the pleasant 'local' road to join the busier Route 21, which continued to hug the west riverbank of the Bassac, which was rather surprisingly devoid of any river traffic, even small fishing boats. Stopping at another four wats enroute, we didn't see anything of real interest until we reached Wat Prek Ambel around 10.30am. With steps leading down to the river, this large wat had a very colourful and ornate vihara which was undergoing reconstruction and a substantial compound housing living quarters for many monks and nuns. Tom pointed across the river towards his own village of Khpoc, which lay on the opposite bank and told me that as a young boy he would sometimes cross the Bassac to this wat with his friends. We continued along the smooth highway, which is the main artery for those heading south to Vietnam and the locals-only border crossing at Chrey Thom. We had to cross lots of small bridges over streams branching off the main river that irrigate the Angkor Borei area to the west and which is heavily flooded every wet season. Because of this, the land on both sides of the Bassac river is particularly productive for rice, vegetable and fruit crops, whilst the province is better known more recently as a hotbed of gasoline smuggling across the border. The road was certainly busy with lots of traffic heading in both directions. Alongwith the many restored pagodas, we encountered quite a few crumbling French colonial-era buildings along the route as well as a handful of wedding parties spilling onto the road, before we reached Prek Thmey, roughly two-thirds of the way to the border. Tom suggested we cross over the river on a small ferry to enable us to meet his family and have some lunch at his home village. A phonecall to his sister, after he asked me what I liked to eat, put the necessary wheels in motion. The ferry, full of schoolchildren, handled people and motorbike traffic only and took five minutes to cross the muddy-brown river, costing 900 riel for the two of us and our moto and deposited us on the opposite riverbank at a village called Kompong Kong. The east bank of the Bassac, the strip of land between the two rivers, was far more rural and undeveloped than along Route 21. Farmers were much in evidence tending their crops and cattle, water canals ran alongside the bumpy track that masqueraded as the main road, whilst the houses were of wooden construction on stilts rather than built of concrete or brick. At mid-day, we stopped at Kompong Kor village for a refreshing sugar-cane drink outside the gates of a school and whilst sat under a tree on the riverbank, were soon surrounded by a group of curious and giggling children. All along the route I received constant hello's and goodbyes, especially when we took a detour to Wat Dei Kralong, where the vihara had beautifully painted external walls, internal paintings and lots of wall mirrors and a boisterous schoolroom nearby. At 1pm we arrived at Khpoc village. This was Tom's birthplace and where his father and most of his family still live. We looked around Wat Khpoc where he spent a short time as a boy and also visited his old school opposite the pagoda. Though he was wearing a helmet, he was recognised by everyone on the way to his father's house and a small welcoming party. Though his father was unwell and was sleeping, his two sisters and their husbands, a brother, his grandmother and a gaggle of nieces and nephews quickly appeared from amongst the surrounding houses. All the adults then sat down on a wooden platform next to the house and a plentiful lunch of chicken, fresh fish and vegetables was served, washed down with bottled water and fresh coconuts. It was an excellent meal and I thanked my hosts for their genuine hospitality. Everyone was pleased to see Tom, who moved away to live in Phnom Penh fifteen years ago and only returns every few months. Today, his return accompanied by a foreigner, had been a special occasion and I was treated as an honoured guest. It was typical of the treatment I receive throughout this beautiful country. Just after 2pm we said our goodbyes and Tom suggested we return to the west bank of the Bassac to speed up our return journey. Just behind the village we boarded another small ferry boat, this time the price rose to 1,000 riel and re-crossed the river. Retracing our steps along Route 21, just before we reached Takhmau at 3.30pm, we once again crossed the Bassac by ferry, this time at my request, to return to a pagoda I'd visited previously in March 1998, called Wat Champuk Ka'Ek. It was the site of a newly-built wat and a killing fields memorial back then. 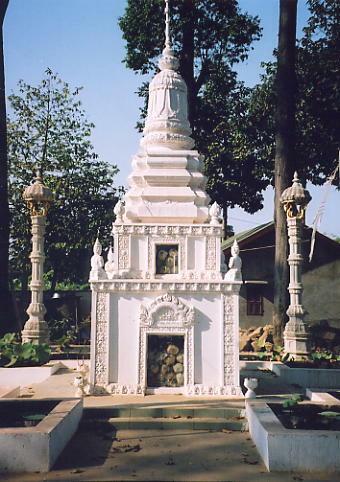 At the entrance it looked like a lot of money had been poured into this pagoda and that was clearly evident by a proliferation of family stupas, a large reclining Buddha, a school and a religious meditation centre that had sprung up surrounding the large central vihara. The stupa containing the remains of the Khmer Rouge victims found nearby had been moved a few hundred metres to a new location. 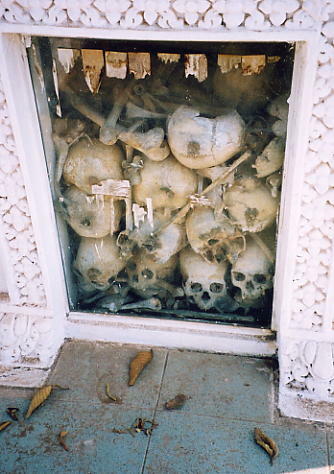 Research by the DC-Cam in Phnom Penh has revealed that a Khmer Rouge prison on the site was responsible for over 18,000 deaths, where the bodies were placed in numerous mass grave pits around the temple grounds. We stopped for a cold drink at a stall in the grounds of the pagoda before returning to Takhmau where we called into another wat with a much older vihara, before heading back to Phnom Penh amongst the late afternoon rush-hour traffic, arriving back at the Dara a little after 5pm. We'd been on the road for ten hours and enjoyed a very pleasant day trip with lovely scenery and friendly people, crowned by the reception I'd been given at Tom's home village. Another successful day in the Cambodian countryside. To contact Tom (his real name is Thourk), e-mail him at: doungthourk@hotmail.com or call him on his mobile telephone, 011 865 631. His spoken English is very good and I recommend him as a moto-driver and city guide. 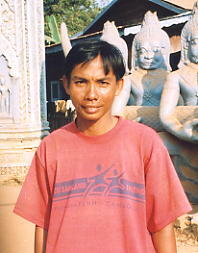 His normal hang-out is the Boddhi Tree guesthouse next to the Toul Sleng Genocide Museum.